If I could, I would tattoo this on my chest and would proudly show it to anyone who thought that their cabinets were better off ‘au naturel’ (particularly men, who think that any wood is good wood). But then I realized how awkward that would be, so I wrote it in jiffy marker and just showed Tim. NO exposed hinges – HALLELUJAH! So, why paint them, right? Well, it wasn’t the WOOD itself that was the problem, it was the COLOUR of it. And really, once the cabinets were painted they would still BE wood, they just wouldn’t be a fugly colour anymore. Sounds good to me! After – a fresh new face! Before, notice the raised peninsula which really chopped-off the flow of the kitchen into the eating area. After, it’s like night and day! My client chose White Dove for the cabinets, which is one of the BEST white paint colours for cabinets. You can see here how it acts like white, without being too stark/icy looking. The paint colour on the walls is BM Pashmina, a GLORIOUS medium toned greige. So there you have it, another painted kitchen makeover. Want to see more? Check out my affordable and FUN E-design services! Beautiful transformation! But I wonder how the cabinets would look if only the paint color and countertops had been changed? The dark colors were making the oak look worse, I think. I love the White Dove cabinets. What color of gray is on the walls? Hi Andrie, I’m such a dork, I forgot to put it in – it’s BM Pashmina! I’ll fix that RIGHT now! I was thinking the same. I LOVE this kitchen! But the walls backsplash and counters have all been replaced with white. The back splash and counters appear to be too white in the photo but actually, they aren’t. TCE 3001 quartz has various particles that are shades of gray, neutral and off-white, the reason why we used it for both the back splash and the counter. It complements our furnace in our living room adjoining the kitchen, maintaining a good flow throughout our open layout floor plan. Hi Denise, I would LOOOVE to, but I just haven’t had any experience using wood filler- I’m kind of a fan of that oak grain coming through (so that it looks like oak!) Dammit, I wish I did, I hate to leave you hanging! I hope that helps! I’m going to copy/paste this into the comment section, but not everyone gets the comment updates, and I wanted to make sure that you got this personally. Very nice!, what is the back splash made of? We used TCE 3001 quartz for both the counter and the back splash. Kylie, I like your blog and your sense of humor!! My kitchen faces east and I have just finished removing stark white paint the previous owners put on our 1960’s birch slab kitchen cabinets. The paint was too icy white and the room truly looked sick. I love the white dove kitchen but is white a good choice for east kitchens? ( I did read your post about colors for east facing rooms). I can stain the cabinets American Walnut and be in keeping with most of this area where stained and varnished wood is still the first choice. Thanks for any suggestions. Thank you for the information. I have painted my red brick fireplace White Dove, as well as doors and trim, so I am “married” to that color at this point. I will paint some foam boards and see if that helps me visualize the kitchen. Our closest Sherwin Williams dealer is 50 miles so Benjamin Moore is my best local choice. If I continue to be color confused I will sign up for an E-consult. I love the White Dove for my cabinets. 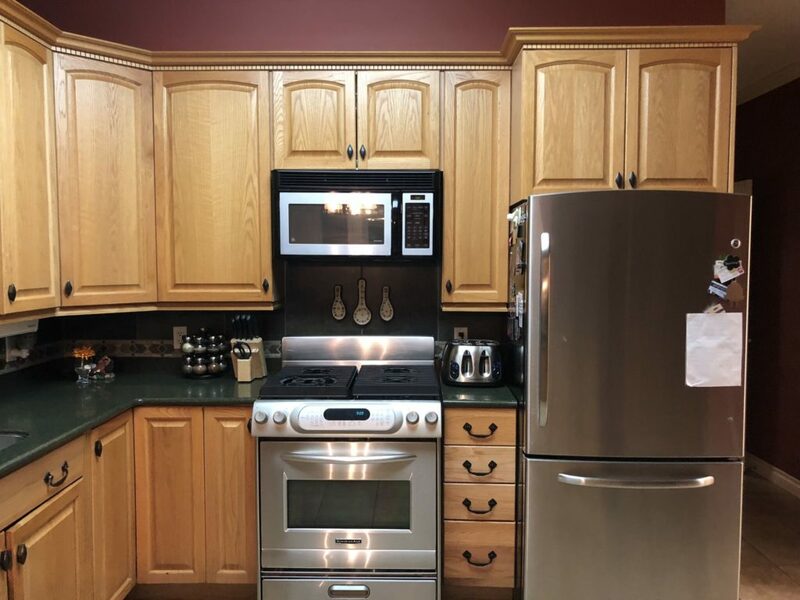 I have a North/West facing kitchen, is the Pashmina accent to dark? Hi Cheryl, it can really depend on HOW much light you get – whether it’s north/south/east/west -as well as interior lighting/countertop/flooring. So, while I’d love to give you a yes/no, I just can’t without photos! If you paint cabinets White Dove, do you paint your trim & ceiling the same? What color is in the living room? Love your blog!